Let's Get Furious! A Tribute to the Furors!!! 38 bands pay tribute to local legends The Furors. These two discs run the gamut. Punk to pop to folk to country to techno to rockabilly. Faithful to far out. Studio polished to lo-fi home recorded. Loud and blaring to quiet and pensive. 38 tracks! A tribute album to a not-so famous local duo is unheard of - let alone a two-CD, 38-song set. 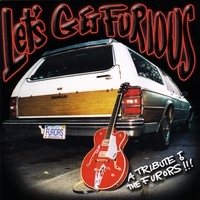 How do you explain "Let's Get Furious," the tribute to New Haven's minimalist pop duo, The Furors? It's like that final scene of "It's a Wonderful Life," where George Bailey watches all his friends pay him back for years of gratitude - minus the financial ruin and suicidal despair leading up to the climax. Folks have come from near and far to contribute. "My friend who used to play bass with us asked me, 'Did you fake your own death?'" said Derek Holcomb, the group's impish-grinned, hiccup-voiced singer/guitarist/writer. He met drummer Tom Dans at Long Island's Huntington High School when Dans, in 11th grade, dated Holcomb's sister. Even if you don't know their five albums of songs, from the double-45 "Electric Guitar and Drums" to "Pleasure and Revenge" - the unabashed pop of "Janet, Janet," the longing of Hey, Joni," the eerie crawl of "All Over You in Seconds" - their music has an ageless quality. "They're such nice people. And their live shows are amazing," said New Haven's Shellye Valauskas; she sang "My Shy Superstar." "They're so high-energy and their songs are well-crafted. What they can do with two guys floors me." Meanwhile, Craig and Claudia Bell of Indianapolis are still enthralled. Craig was on the ground floor of the alternative music scenes in Cleveland (Rocket From the Tombs) and New Haven (The Saucers, Future Plan/The Plan/The Bell System). Claudia, then the New Haven Advocate's music columnist, wrote the liner notes to The Furors' second album, "Completely Furious." "Take 'A Pretty Picture.' It's such a beautiful song," Craig Bell said. "'We were so beautiful together, but not now.' Or 'Go, go far away, and when you get there, don't stop.' He's a phenomenal writer. "(The songs) can all stand up to being done by so many people in so many ways," Claudia added. "Right there, that says it all." Indeed, The Furors' songs are adaptable to many styles: The Forgotten Ones' country-twang on "This Is a Desperate Man"; The Manchurians' Bo Diddley shake on "A Thing for Blondes"; the solo acoustic "I Kissed Your Wife" by Frank Critelli; "Her Other Man," a three-chord punk rave by The Survivors; or the punk-meets-country flair of "I Went Out at Night" by The Big Fat Combo - led by Tom Hearn of Cheshire, who conceived the tribute in the first place. "They write really good songs," said The Forgotten Ones' Jamie McGann of Branford - the former James Methwreck of New Haven punks The Poodle Boys. "I think it's wonderful they're the last band standing." Plus, there's the "Q" factor - "quirky," a word used to describe The Furors before They Might Be Giants cornered the market. Maybe it's Holcomb's grin or his vocal delivery, but it's a word that's not very far away. "People always called me quirky. Now I take it as a compliment," Holcomb said. "(But) it's like emo bands - there are certain words nobody wants to be considered." "We had played a gig at a place in Wallingford called the Sanctuary," Holcomb said. "Hearn (then) called me and said he'd like my blessing, but if he didn't get it, he was still doing it. I said, 'Good luck.' I thought that you couldn't cover our material. Nobody could sing it." "I was marveling at how good these guys were," Hearn said. Every time I went to see them, no one was there. But the people who went to see them had a band or a label or a column, and they all had big smiles on their faces, and it seemed like there must be something about them." "He said we should do it," said DeRosa. "We called a few people. We thought, at best, we'd have 10 acts." "Within one week, we had 24 people on the list," said Hearn. "By April, we realized, we said, 'If it's gonna go to two discs, it's gonna go to two discs.'" And after much, much delay, here they are. And The Furors were floored. "It was the nicest thing anyone has ever done for us," Dans said. "I was amazed to hear our material so well-produced, better than we could do. I was excited by the thought of anybody besides us playing our music." "The entirety of it, to hear it all in one listen, was stunning," Holcomb added. "I wanted more! Where's the third disc?" They were both in the orchestra and choir at Huntington High School on Long Island. "Tom played the flute, I played violin," Holcomb said. "Tom played well, I played badly." Disk #1 includes an embedded video of The Furors performing "Hey, Joni", courtesy of Mark Mulcahy. It may not work on all computers, so see it here: http://www.youtube.com/watch?v=FBZugnx3BdQ . A friend had invited me to a coffee house gig he had booked featuring The Furors doing an acoustic show - not their normal style of playing. The Furors normally play plugged in with Tom on drums, backing vocals and handling any percussion chores that might pop up, while Derek plays guitar and sings, both in a manner that fit the quirky, intelligent pop ditties that make you wonder why the band They Might Be Giants could make a living on songs like these, while The Furors have gone relatively unnoticed. In this acoustic setting (and my first time seeing/hearing them) I was amazed. Derek played the guitar like a refined lunatic, holding it high on his chest for close intimate sounds, yet thrashing spastically when the punch and oommfff of the song called for it. Singing in altos and falsettos, he would bend and contort his facial muscles to help his voice find the idiosyncratic inflections needed to fit each of the compositions. In contrast, Tom sat behind his drum kit deceivingly stolid-like as he played not only the drums, but such percussion goodies like a toy piano, 5 different pitched bells (I’m sure there’s a technical name for them which I am uneducated on), a penny whistle, New Years Eve noise makers, a miniature gong, castanets, and a host of others with such precision and passion that the music created by the two of them jumped alive and swirled in my head. What seemed like two extremes were actually a team of unparalleled synch; mirroring each other with opposite styles to create a seamless tapestry of musical sound, all stitched together with lyrics of thesis quality depth transposed into 3-minute songs. Needless to say I was hooked. Has there ever been a tribute album anywhere to a local band by local bands? Much less, a double-disc set that traverses almost every boundary in contemporary popular music? The Furors have been mainstays on the New Haven music scene. Such is the respect for them as songwriters and performers that contributions to this compilation flowed in not just from veterans of the original New Haven punk scene (Saucers Craig Bell, Malcolm Marsden, Mark Mulcahy and Seth Tiven; Sal Paradise of the Subdueds; Spike Priggen of the Obvious; the Survivors; Larry Loud; James McGann aka James Methwreck of the Poodle Boys) but also from youngsters like the Vultures and the Danglers. And plenty of others who fit neither category but wanted to tip their musical caps to this esteemed duo of colleagues. These two discs run the gamut. Punk to pop to folk to country to techno to rockabilly. Faithful to far out. Studio polished to lo-fi home recorded. Loud and blaring to quiet and pensive. The Furors catalog is so deep that there was no need to contend over song choices - plenty of good songs to go around with plenty left over and no musicians' egos bruised in the process! There's a story of Derek Holcomb's neighbor, the eminent literary scholar Harold Bloom, breaking up a loud Furors rehearsal by intoning "Gentlemen! A little less furor, please!" They are, at first glance, a simple band - two guys, a guitar, and drums. Derek patters and scampers, singing in his patented up-down-all-around childlike chortle. Tom Dans keeps the rhythm. But their music, as the bands on this celebratory disk can tell you, is infinitely complex. Beatlesque harmonies with scruffy punk overtones. Buddy Holly-esque riffs played carefully akilter, as if a chip in Derek's head was channeling the notes through a whole new musical equation. The lyrics are clear ("I rolled down the window of my car on the Industrial Park"), blunt (How pretty you were, when I cared"), brazen ("I kissed your wife goodnight, and I'll be back again"), sweet and melodic and adorably scruffy. Then there are the flourishes: the literal bells and whistles that make a Furors performance tingle and toot. I am a relative latecomer to the long-lived local legend that is The Furors. I first saw them at a benefit for a scruffy art gallery in the most depressed part of downtown New Haven. But I knew whence they sprang. They'd spent some time in my new wave hometown of Boston, soaking up that city's curiously friendly and comic punk scene. Their innate pop smarts were augmented by the avant-garde. They told me that, as high school students in New York state, they'd snuck into the city to see The Bonzo Dog Band live, and I have never felt more jealous. Once when interviewing them, Derek and Tom presented me with several cassettes of Offenbach operettas they'd taped for me, in another vain attempt to explain their disparate influences. They also gifted me with a complete set of their early singles, a gorgeous collection of visual art objects unto themselves. That singles collection (since anthologized locally as a limited edition CD-R) includes The Furors' breakthrough two-45 set "Electric Guitar and Drums". The title was the format of the band, despite some dalliances as a trio prior and subsequent to that set. The labels on the records have no words on them, and each is a different bright color - blue, green, yellow, red. After my instantaneous conversion to their colorful, cartoonish and chaotic cause, I wrote about The Furors every chance I got - even when they hadn't released a record in years or played out in months. A New Haven without the Furors wasn't worth living in. Over the past few years they've reemerged with graceful underkill. In the small type on their recordings, "Recorded live in the studio" gave way to "Recorded live in the basement." Luckily, there are several promoters who ask them to play regularly, whether for their recent and revelatory stripped-down acoustic-and-toy-instrument sets or for the plugged-in jump-and-split rave-ups.